Raising a young child in this day and age of fast paced life is difficult. It is hard to keep up with the excitement of animated video games and television shows, which often times are not displaying the behavior or teaching the lessons that we want our young children to learn and emulate. This is why we at Signing Savvy are very proud to have a partnership with an animation company, called WonderGrove Kids, that’s primary focus is to take the wonder and fascination of animation, and use it in a very positive way to teach children the basic fundamental building blocks of life. to teach children lessons for their everyday life to help them reach their full potential. WonderGrove Kids have created an amazingly sweet and fun group of characters to help children of all walks of life have the opportunities to learn through animation. They have taken simple daily lessons and made them into great teachable videos, very colorful and fun to watch, yet short enough in length that they keep children’s attention. They are specifically designed to fit well with an Early Childhood Curriculum and perfect for daily use in the home or classroom. Children will ask to watch them over and over. 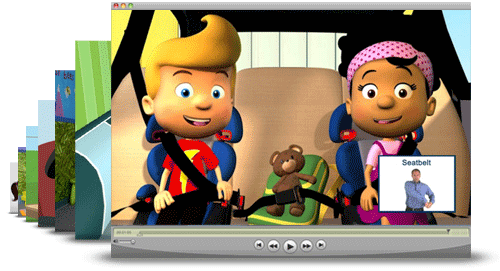 From "Always Buckle Your Seatbelt" to "Respect Others on the Playground" and "How to Order a Balanced Meal," the WonderGrove Kids series provides parents and teachers with a well-rounded selection of animated learning episodes to help children prepare for the daily challenges of life both inside and outside of school. Working with Signing Savvy, WonderGrove Kids has created a sign language version of their animations. In the sign language version, not only are the animations closed captioned, but the key concepts presented throughout the animations are reenforced with sign language videos. The sign language version of the animations are great for children (and adults) that want to pickup and practice sign language vocabulary, including young hard of hearing and deaf children and hearing children that may have been introduced to baby sign language. Children with communicative delays can also benefit from the animations. Learning and using sign language has been shown to help with understanding vocabulary and context and improve overall communication. We're excited to bring you sign language through these adorable animated lessons. Check WonderGrove Kids out! They will be a very welcome addition to any child's learning experience. I am very pleased with the WonderGrove Kids videos with the sign language version. I have 6 students in a daycare with a preschool program. Ages 3 to 5. We have watched three videos already, and the children love them, especially since they are already familiar with Signing Savvy. They call John "the signing Dad" lol! The only improvement for us would be if the "signing picture" was a little bit larger...I have 6 students sitting in front of the computer and that is the only thing they asked for...a larger signing dad. Really great for education, in my opinion. Thanks! LOL at the Signing Dad! I will have to share with my own children that there are six precious little daycare children out there that actually want to see their father in a larger picture! Too cute! Thanks for the ego boost! Yes, kids are very crazy to see these animated pictures and They also wanted to see the overall story with the animated characters. The Signing Savvy Member App is now available on the Amazon App Store. Having the app on the Amazon App Store makes it easier to install the app on Kindle Fire devices. The Signing Savvy Member App has been available on the Apple App Store for iOS devices and Google Play for Android devices for some time, so we are excited to be able to offer it on the Amazon App Store now as well. 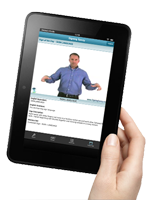 The Signing Savvy Member App is for Signing Savvy full members. If you are not yet a full member, you can still use the app to easily check the Sign of the Day on your mobile device. The Signing Savvy Member App allows full members to search and browse signs and word lists, create word lists, and use digital flash cards. NOTE: While you can access the full website through the browser on most of the mobile devices, the app presents a more streamlined mobile interface. Works great on iphone 5 and carries over your word lists!!! I gave the apple iphone app a "5". It is so well implemented. It remembers your sign-in info on your iphone (mine is an iPhone 5). It has all the features of the web signing savvy, telling you if it is ASL, English, and variants. I found quickly that it has the word lists I have built on the web. THAT IS GREAT!!! For instance, now away from the computer I can easily look up a word I have forgotten but which I have included in one of my many lists. Great impementation. Large picture. Wonderful. You have clearly said that the app is for members. It is a shame that people have given this app less than 5 stars who are not members. 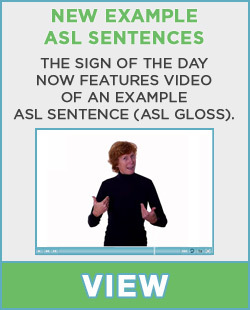 I think Signing Savvy is a wonderful and easy way to learn American Sign Language(ASL). I have learned a lot of important things from this website, and it has helped me a lot. My 2nd cousin is deaf, so now I'll know what she's saying! This Signing Savvy App has helped a few times and would help me more if it did not crash so often. I have an iPhone 4 and with the app it crashes regularly. I have to open it and re-open it just to look up one sign, and often enough it crashes right after it loads said sign. Sometimes i barley get a chance to look at the sign! I really sugest that you update the app so it won't crash. Do you know what version of the iOS is installed on your iPhone 4? The app should not crash AND does not crash on the devices we have tested it on. How soon until there's an app for Windows 8?? Love signingsavvy!! Right now there are no plans for a Windows 8 app since the website works great in the browser on Windows 8. PLease let all readers know that ASL has as many facets to it as a diamond & is often called "The Animated Language" because we do not just talk with our hands, but also with out entire bodies(facial expressions, movement of the body, etc). I so do enjoy reading all the different topics here & have saved a bunch of money because of it. Thank you again & GOD Bless. MAY YOU LIVE LONG ENOUGH TO BE BURIED IN THE COFFIN THAT IS MADE FROM A 100 YEAR OLD OAK TREE THAT i SHALL PLANT TOMORROW. Tune into the television show Switched at Birth tonight (Monday, March 4th), to see the new episode "Uprising" told entirely in American Sign Language (ASL). It airs at 8/7 central time on ABC Family. It will be the first show on mainstream television to air in entirely ASL. The episode will have open captions for hearing viewers. The storyline was inspired by protests that happened 25 years ago this March at Gallaudet University. The real-life "Deaf President Now" protests began on March 6, 1988 when the Gallaudet Board of Trustees appointed its seventh hearing president. The protests ended seven days later, on March 13th, after the first Deaf university president, I. King Jordan was appointed. In the new Switched at Birth "Uprising" episode Daphne leads a demonstration after learning the Carlton School for the Deaf may close. Switched at Birth is a one-hour television show about two teenagers who were switched at birth. One of the teenagers is deaf and the show incorporates sign language into most episodes. The show was first aired in June 2011 and is now in it's second season. Check out the all ASL episode tonight to see the beauty of sign language in action! For more information see the Video on Switched at Birth's All-ASL Episode. To catch up on any episodes you may have missed, you can watch Switched At Birth online at the xfinity TV Switched at Birth webpage or the ABC Family Switched at Birth website. At last! We have a main stream TV show showing ASL in real life situations! I have had several questions about how to teach young children to sign recently, so I wanted to repost an article I wrote back in 2009 (with a few modifications), which answers many of the questions. Research has shown that a child's muscles in the hands and fingers develop at a faster rate than those in the mouth and jaw. This shows us that a child is better equipped at a young age to sign before they can speak. And children certainly can understand language long before they can speak. Because of this many people are choosing to teach their infants to use sign language as an early form of communication, oftern refered to as "baby signing". It has been known to cut down on the amount of frustration on the part of an infant trying to communicate with their parents/caregivers. Many people's questions then are: "How do we teach a young child to sign (deaf or hearing) in a way that is fun and productive?" My answer: Through play! I had the pleasure of watching a young, 3-year-old, deaf child play yesterday while I met with her teacher and parents during a yearly meeting for the child's education. I watched this cute little preschooler interacting rather naturally with the toys in the dramatic play area (toy kitchen, doctor kit, etc…). She was using the play microwave and placing the plastic food on a plate and "warming it up" for us. Using one hand to punch the keys on the keypad as she counted off the numbers with the other. Then she took the spaghetti out of the microwave telling us to be CAREFUL and to wait because it was HOT. The teacher prompted the child to tell us what the food was that was on the plate, to which the child answered SPAGHETTI rather matter-a-factly! The child went to play for a good 30 minutes giving us each SHOTS from her doctor kit and telling us not to CRY, etc…. The language used and expressed by this child was amazing and it was all done through play! Signing Savvy can help with this educational/play experience by using the printing options to create word cards for you to use at home during your play with your child. By having the food signs printed on cards that can be exchanged when you "order your food" and having the child match up the sign to the food, a child will become familiar with the signs for the toys they interact with daily. Create a menu that not only has the food signs on it but some common phrases like, "Can I take your order?" or "Thank you, please come again". Another playful activity is to play "sign and seek", where you first introduce a few objects and the sign for the objects to your child. Then you scatter the objects around the room. After which, you show the sign for an object and ask your child to bring it to you. If you are learning sign language yourself, the Signing Savvy Member App on a mobile device, such as an iPad, is a great way to quickly look up sign videos while playing this game. You could even make a word list of all the objects in your room prior to playing, so you have quick access while you play. Have fun with it….you'll be amazed how quickly your child (and you) will be using sign throughout your playful day! We hope you have a great Valentine's Day! This is a reposting of our blog post from last Valentine's day. It does a great job of covering all the different ways to show LOVE... in sign language that is! Many people know and use the sign for I LOVE YOU. This sign is used universal throughout the country and the world. We see it all over television, at sporting events and during "shout outs" to our mothers. The sign is actually the combination of the fingerspelled letters I, L and Y.
I have had people ask why the sign looks similar to the one that some people hold up at rock concerts, where the thumb is held down and the pointer finger and the little finger are held up. It is NOT the same. Remember, the thumb of the Y hand has to be present in order for you to be signing the I LOVE YOU sign. Another sign that gets confused with the I LOVE YOU sign is the Hawaiian "shaka" sign meaning aloha, hang loose, or right on. Interestingly, this is also the ASL sign for YELLOW. Again, this is a different sign, as it leaves out the pointer finger. It is basically just shaking the Y hand. The actual sign for LOVE is both arms folded across the chest. That is to show love or have love for another person or animal, etc. Another sign for LOVE that you will see on the site is the kissing of the back of the S hand, then pulling it away from the mouth. This is a sign that is generally used to show a passion for something, like a certain type of food or a type of music. Some people have asked why we don’t list the I LOVE YOU sign under the sign for LOVE on our site. It is because they are different signs and we don’t want new signers to confuse the single I LOVE YOU handshape with the general meanings and uses of the word LOVE. We don’t want you to confuse the signs and use the I LOVE YOU sign in a place where you really mean to just say LOVE. An example of this would be this sentence: My mother loves to travel. You wouldn’t want to say: MOTHER + MINE + I LOVE YOU + TRAVEL (It just doesn’t make sense.) You need to use the sign LOVE there. Another example sentence: I love to eat deep dish pizza! You wouldn’t want to say: PIZZA + THICK + I LOVE YOU + EAT. You need to use the kissing the back of the hand version of LOVE in this instance. I hope that clears up some of your LOVE issues! Spread the LOVE and Happy Valentine’s Day from all of us at Signing Savvy! Re: what sign is it? It looks more like a sexual sign. so cute! i never knew that the letteers I-L-Y were combined!